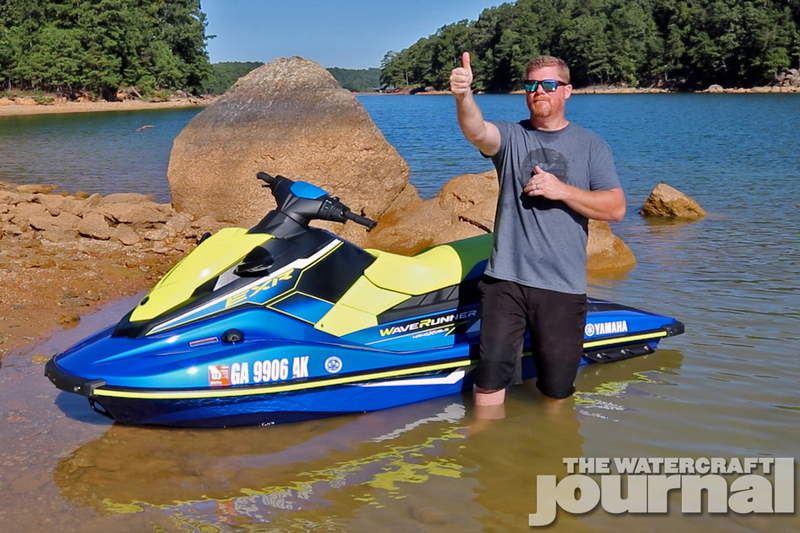 Budget Bottle Rocket: 2019 Yamaha EXR WaveRunner (Video) | The Watercraft Journal | the best resource for JetSki, WaveRunner, and SeaDoo enthusiasts and most popular Personal WaterCraft site in the world! 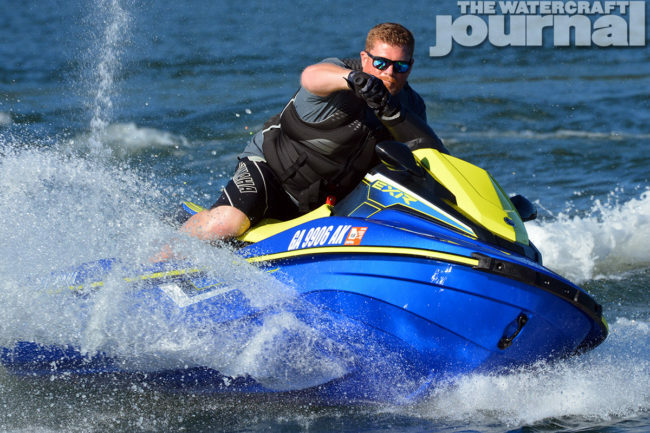 While his particular brand of fun is entirely subjective considering that we and tens of thousands have had countless hours of fun aboard the newest watercraft that today’s manufacturers offer, we could commiserate with our friend somewhat. Our earliest years riding personal watercraft were aboard primitive WaveRunners, WaveJammers and the rowdy WaveBlaster – all offerings from Yamaha Motor Corp. USA. And yes, all of these were notably smaller than today’s fare. In 1993, Yamaha introduced the WaveBlaster, a brightly-hued 320-pound, 2-seater propelled by a 701cc two-cylinder 2-stroke producing a then-class leading 63 horsepower. 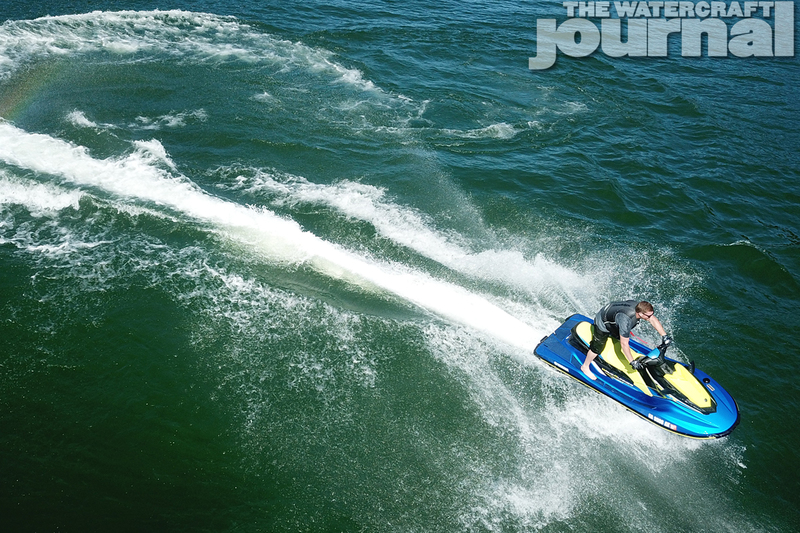 For the three years it was produced (1993-1996), the ‘Blaster quickly became a fan favorite due to its lightweight and nimble hull and brappy, almost-instant throttle-response. Even today, the impact of the ‘Blaster upon the market is notable with a vibrant aftermarket continually producing performance and handling parts. 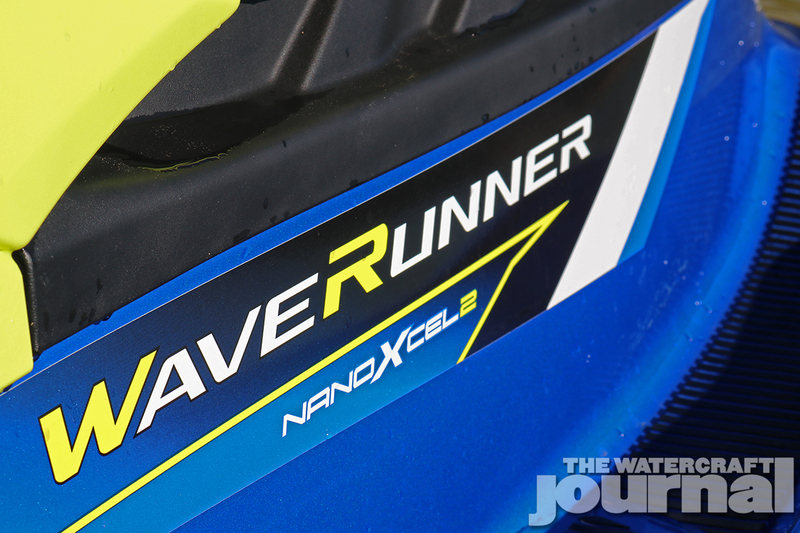 Interestingly, it was this very same machine that Yamaha’s product development team had in mind when creating the 2019 EXR WaveRunner. Based upon Yamaha’s Rec-Lite EX platform introduced only two years earlier, the ski had a long way to go before being comparable to its predecessor. 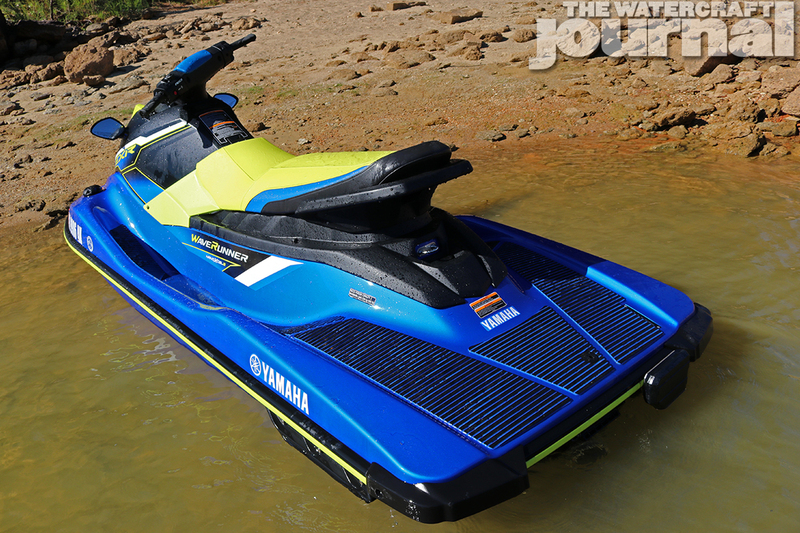 In its basic form, the EX weighs 600-pounds, produces 102-horspower, and while certainly being a fun, well-balanced entry to Yamaha’s runabout lineup, is a far cry from the ‘Blaster of yesteryear. 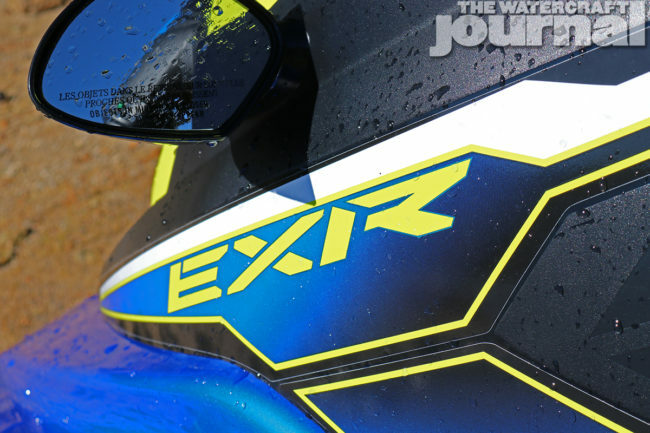 If the EXR was going to honor the 2-seater of the past, Yamaha knew it would need to step up their game. Yamaha’s team had decided early-on that the “R” designation attached to its performance-minded machines would need to have to carry much more weight than in previous years. 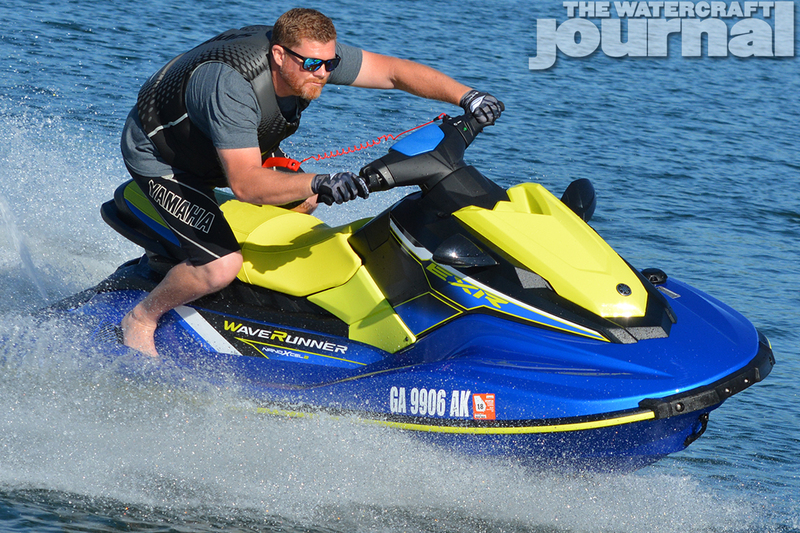 The newly rechristened GP1800R and naturally-aspirated sibling, the VXR, both received aggressive top-loader intake grates and redesigned ride plates for 2019, as well as the VXR being cast from Yamaha’s weight-saving-yet-durable NanoXcel2 SMC (sheet molding compound) bonding material as the GP1800R. For the EXR to rise to the same level, NanoXcel2 would also be used here. The change shaved a considerable 60 pounds from the machine, dropping it to 540-pounds (putting it 11-pounds less than Kawasaki’s 4-stroke standup SX-R). 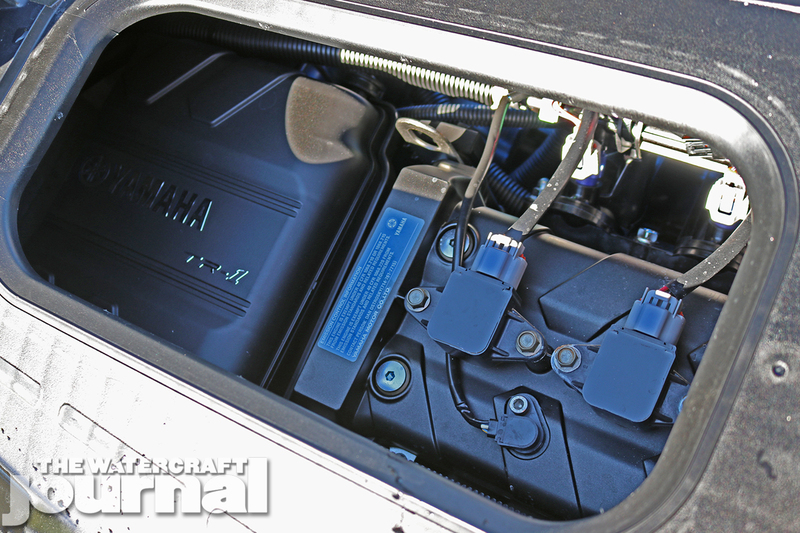 Equally, a new aggressively-angled top loader intake grate was installed to give the EXR greater hookup and traction in the turns. 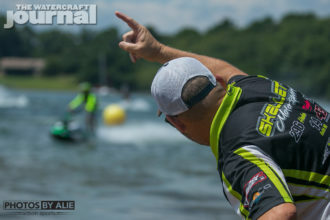 Additionally, a 40mm pump extension relocated the impeller further back, allowing the EXR superior hookup and reduced cavitation from its 144mm high-pressure pump, a thoughtful addition proving that Yamaha pays attention to what racers are cooking up. 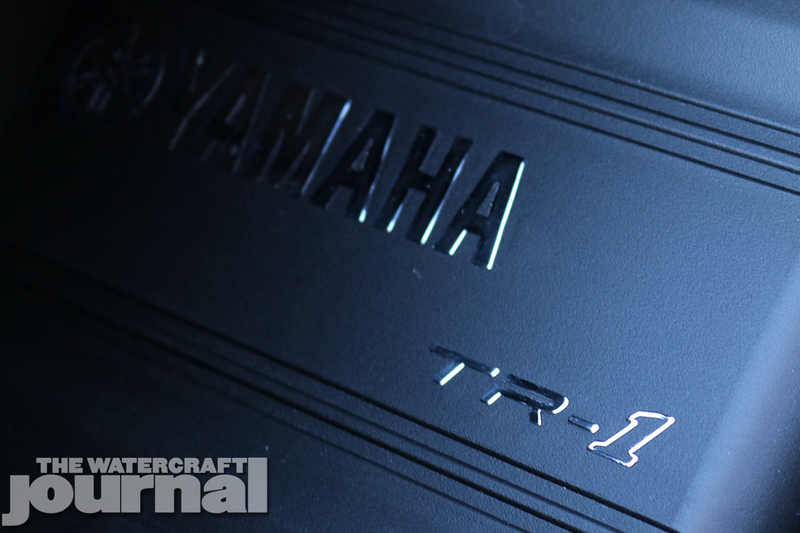 Equally, the EX’s TR-1 3-cylinder was given an ECU reflash, bumping the 1,049cc 4-stroke’s output to 110-horsepower (one of the few times Yamaha has advertised horsepower numbers with a new PWC) – dubbing it the TR-1 High Output (HO). A slight change was made to the EXR’s exhaust system as well, which we quickly noted when we first fired up the ski. It sounded…well, like a 2-stroke! Sure, you had to blip the throttle like you might a standup ski, but the tinny, mechanical echo of a 2-stroke was clearly audible. “Yeah, we did that on purpose,” Yamaha WaveRunner Product Manager Scott Watkins smirked devilishly. “We knew what kind of guys we were going after with [the EXR] and knew they’d want to hear that [exhaust note].” The final result of the above changes – particularly the lightweight and increased horsepower – is a throttle that is, in many ways, more responsive than ever the GP1800R. 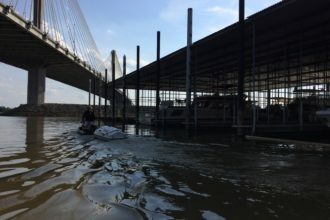 Power is immediate and the EXR responds in kind, leaping excitedly out of the water and sprinting up to a recorded maximum GPS-recorded speed of 54.6mph at 8,000rpm (nearly 5mph and 7,000rpm above the standard EX TR-1). Unlike the ‘Blaster for which the EXR narrowly received the same name, the EXR is rated as a 3-seater compared to the WaveBlaster’s two persons. 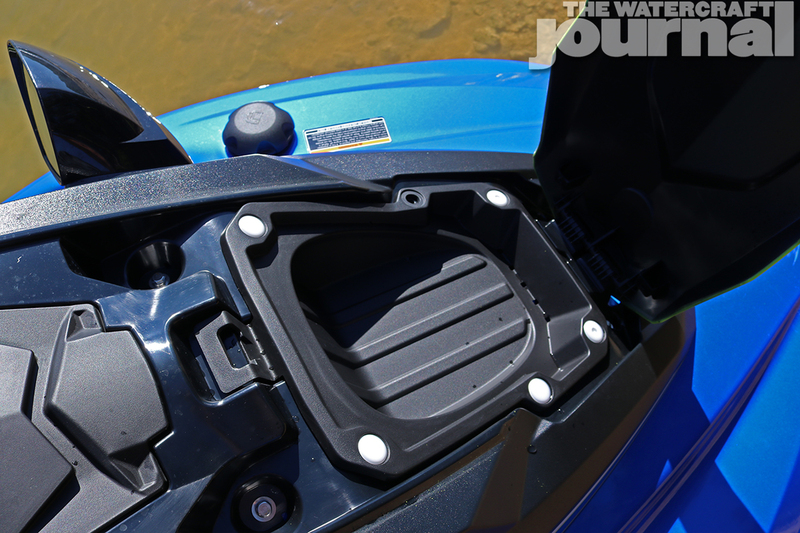 Additionally, the EXR benefits from a large 13.2-gallon capacity fuel cell, 7.7-gallons of storage, two-tone Hydro-Turf traction mats, a padded spring-loaded folding swim step, and of course, Yamaha’s RiDE dual-throttle brake and reverse system. To that point, the only two items that pilots are provided are the forward throttle and the RiDe left-hand trigger. No electric trim, cruise control or No Wake features are found on the EXR. And for most of you reading this, that is all you’d want anyway. To date, we’ve had three separate experiences with the EXR, together totaling about 3 solid weeks with the machine – and without a doubt, it is easily the most excitable, exhaustive fun we’ve had on a runabout (particularly a Rec-Lite entry) in a long, long time. Pedestrian tricks like bunny hops, donuts, 360’s, wheelies, and even the harder-to-execute on-the-bondrail power slides from our youth are easily achieved. 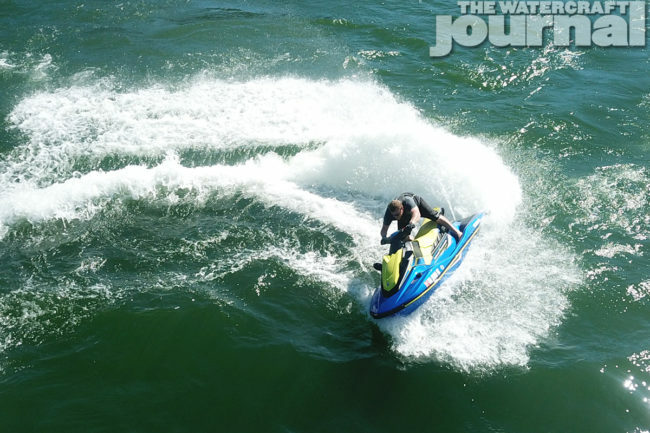 Wave jumping is an endorphin-rewarding experience, launching the tiny craft high into the air. While cruising at speed, the EXR – like its EX siblings – is a relatively dry ride; its narrow bench seat and sloping footwells giving an upright but comfortable static riding position. But riding this way would be to wholly miss the craft’s purpose – like riding a standup ski solely upon your knees. Standing with your feet back and shoulders up over the handlebars is how the EXR wants to be ridden; responding to every shift in weight, every flick of the throttle and snap of the steering with immediate, excitable fervor. Bathed in a retina-searing Azure Blue with Lime Yellow, the EXR is wrapped in bright graphics, and a high quality cut-and-sew thickly-stitched one-piece bench seat. 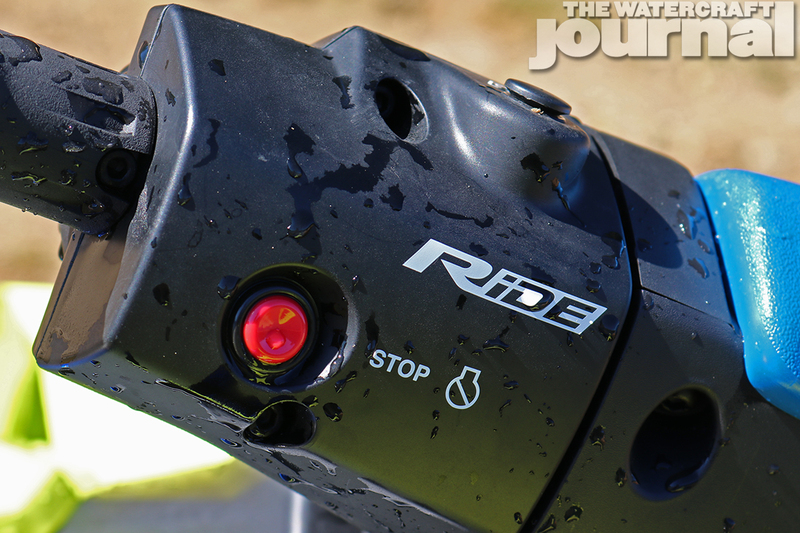 A stainless tow eye juts out from below the rear of the bench permitting the towing of a raft or knee boarder, although the EXR’s lightweight might result in a case of the “tail wagging the dog.” Priced at $9,299, the EXR is certainly the most expensive entry in the entire Rec-Lite category, but understandably so given its race-readiness. And its this very idea – that the EXR is race ready – that is so unique. 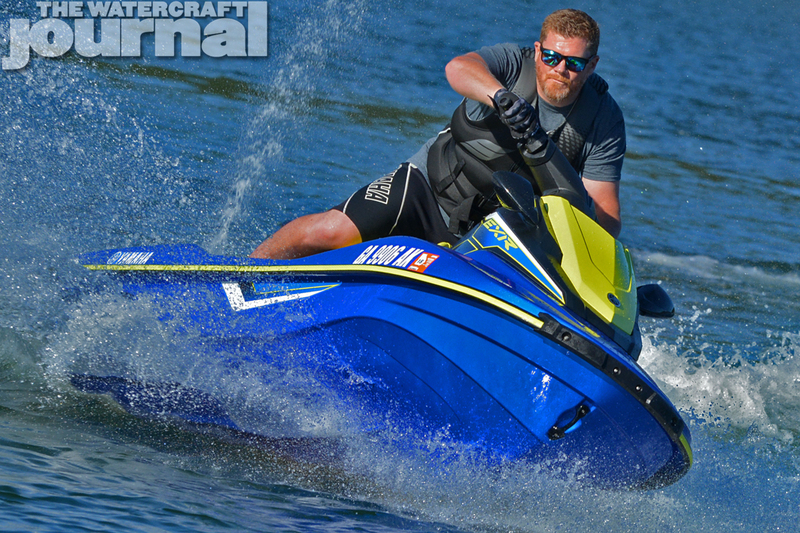 The EXR is the only Rec-Lite craft, that if equipped with a minimal amount of parts, could handily dominate its class segment. Rec-Lite racing is rapidly growing to include both Veteran and youth racers and for good cause – and the EXR is the perfect fit. Almost supernatural throttle and rider response, reduced weight and a setback pump producing superior hookup gives the EXR a superior edge over not only the competition but other EX models. 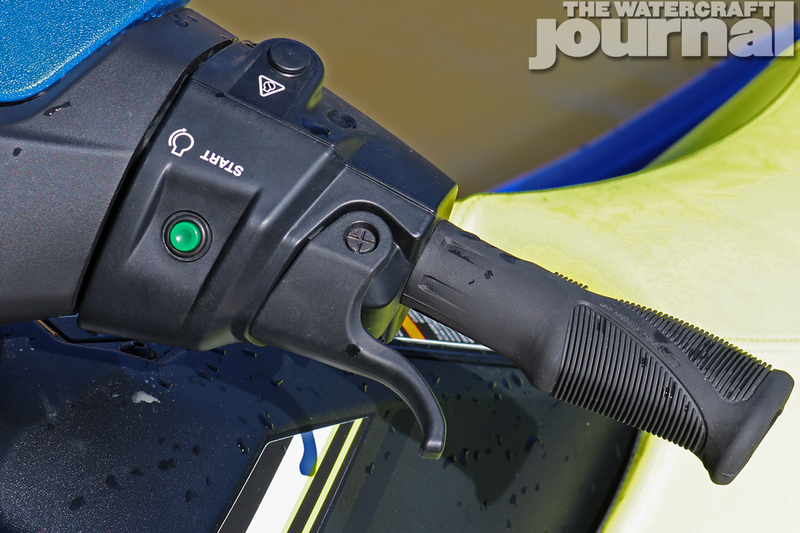 As is with all EX models, the LCD screen below the handlebars is a wee bit awkwardly placed for taller riders, requiring some stooping to glimpse quickly. The front wet storage is unusually shallow and can be clumsy to close if a wet rope or flipflops are sliding on the bin’s plastic surface. Thankfully, the EXR’s center console is cavernous. Narrow but insatiably deep, a can of spray sunscreen, water bottle or even flipflops slide within without much trouble. Beneath the passenger’s seat is a final (and removable) storage tub, as well as a fire extinguisher mounted to a removable tray. The TR-1 HO marine engine is accessed by removing the bench seat and via two portals cast into the black plastic “sub-deck” to reach for the dipstick, oil filter, battery or other maintenance items. For full engine access, the entire sub-deck can be removed with 15 screws within a minute’s time exposing the entirety of the engine compartment. The more technically savvy will note that the flywheel and coupler are a single piece, as well as the composite molded pump stator and impeller housing. 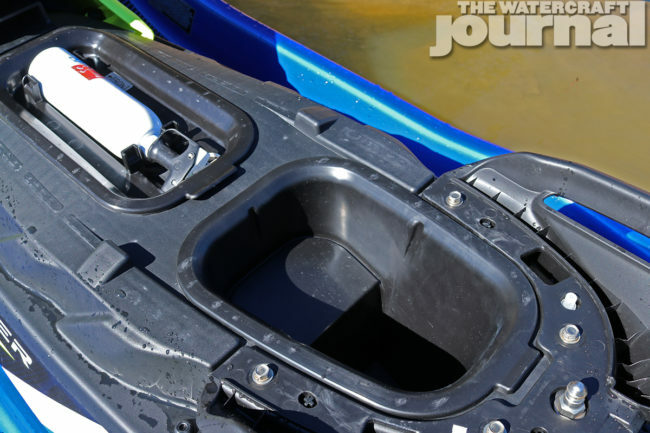 Curious how well the new EXR stacked up against its famous predecessor, the WaveBlaster, we referenced our previous article, Weight Watchers: The Power of Power-to-Weight Ratios to evaluate the two craft’s respective power-to-weight ratios. Weighing in at 360-pounds and producing a total of 63-horsepower, the 1993 ‘Blaster earned a power-to-weight ratio of .20:1 (horsepower per pound). Interestingly, at 540-pounds and making 110-horsepower, the 2019 Yamaha EXR WaveRunner came in at an identical .20:1 ratio! 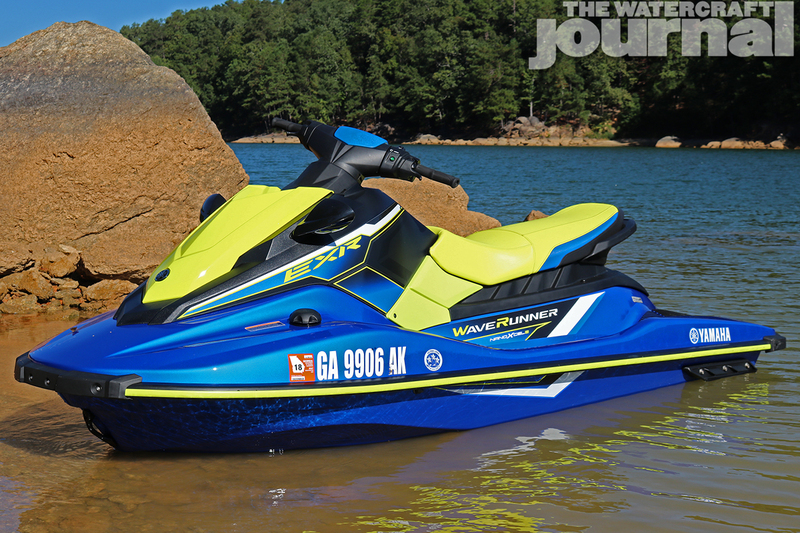 While certainly the new EXR is larger (10’3″ long and 44.5″ wide), it’s power-to-weight ratio is equal to the 1993 entry. 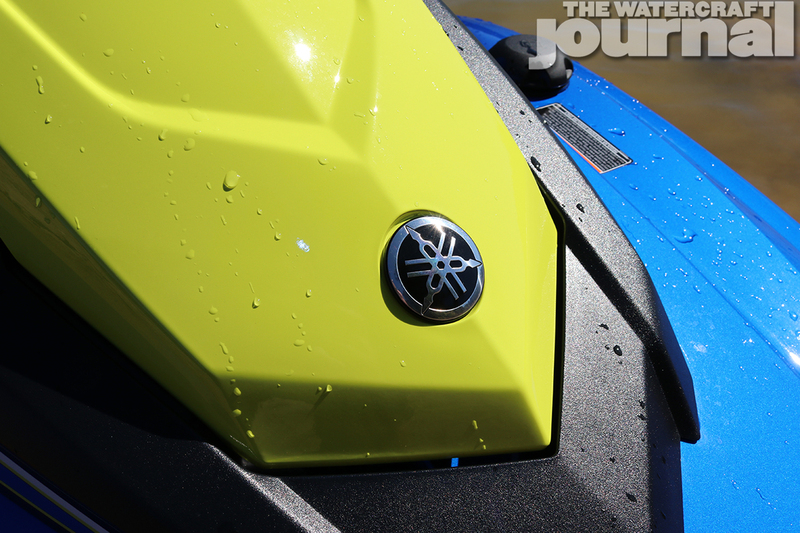 In returning to our disenchanted friend above, we urged him to look into the 2019 Yamaha EXR WaveRunner. In our time with EXR we produced half of a dozen videos, including a full-length review episode of “Long Haul,” which we’ve included here as well as a massive hour-plus-long walk-around as a Facebook Live segment that is linked HERE, all of which reiterates the features and characteristics of this exciting little machine that we’ve shared in this article. 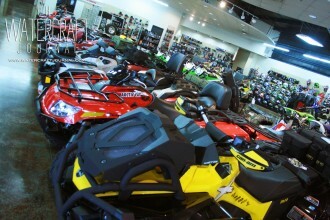 So again, if you’re like our friend and are looking for something closer to what you grew up riding, the EXR is it.